The CWGC office in Ypres is the head office for the Northern Europe Area, which includes responsibility for the administration and maintenance of all the British and Commonwealth military cemeteries and official commemorative memorials in Belgium. Founded in 1917 the Commonwealth War Graves Commission maintains graves and memorials all over the world for over 1.7 million British and Commonwealth casualties who died in the First and Second World Wars and in subsequent conflicts. An information centre is open to visitors at 33 Menenstraat, the street leading from the Grote Markt (market square) to the Menin Gate Memorial to the Missing. Visitors may call in to the Information Centre or to the main office during office opening hours without an appointment to make enquiries about finding a grave or place of commemoration in the British and Commonwealth military cemeteries or memorials in Belgium and other parts of the world. The CWGC Information Centre is located at 33 Menenstraat close to the Menin Gate Memorial to the Missing. The CWGC office in Ieper (Ypres) is located on Elverdingsestraat in the north-west part of the town. It is about 15 minutes' walk from the Grote Markt (market square). 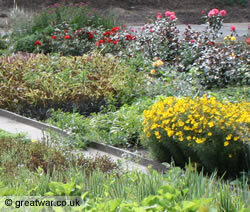 Plant nursery at Lijssenthoek Military Cemetery. 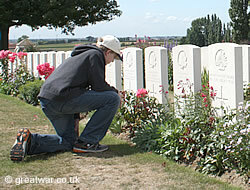 A young visitor at Tyne Cot Cemetery, Passchendaele (Passendale), the largest British military cemetery in the world. See our information page about the CWGC to find out what information is available for all military casualties of the First World War who died, and to get a link to the CWGC searchable online “Debt of Honour” register.